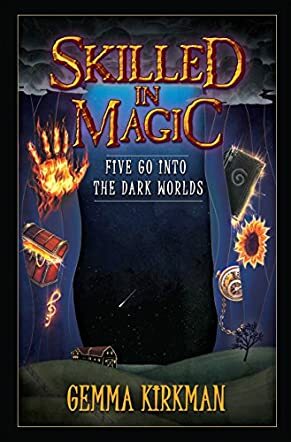 Skilled in Magic: Five Go Into The Dark Worlds by Gemma Kirkman is the first book in the Skilled in Magic series. After losing their parents, the Dellik siblings have only relied on each other. The siblings share a strong bond and a powerful secret. Each has a unique power and a strange birthmark on their hands. When they meet their new guardian called the Professor, they quickly discover something off about their new home, including a strange horse Julian finds himself drawn to and monsters lurking in the woods. These encounters cause a chain of events the siblings never expected. When they uncover the truth of their parents' death at the hands of Lord Mediarn, they also learn of a dark secret their parents kept from them. The siblings are determined to face the man responsible and make him pay, but their only chance against the evil lord is to learn to work together, master their powers, and fight deadly creatures. The relationship between the siblings is the heart of the story and their magic is the key to the mysteries they uncover. Each sibling has a unique ability to match their personality. Each of their abilities comes into play for key moments, but also as the center of their characters and their secret they share, which adds to their bond. Their magic is a fun thing for them as each year they show off their powers on their birthdays and this adds a certain sweetness to their relationship with each other. They banter and argue as siblings do, at times lashing out, but they're always quick to protect and support each other. Their family unit is their safe haven as they're the only ones they've had to rely on after being moved from boarding school and sent to live with their new guardian, the Professor. The professor starts off with a personality similar to the absent-minded professor trope, but as secrets are uncovered he slowly reveals the part he plays in the siblings' past and becomes more involved in what's happening. The house he lives in has an air of mystery and these secrets are what drive the kids to explore where they eventually discover the truth of Lord Mediarn and their powers. Gemma Kirkman incorporates mysterious foreshadowing throughout, leading up to the the dangerous showdown with Lord Mediarn and the ultimate test of their powers. Skilled in Magic is a charming read which pulls you into a magical adventure about four siblings who discover a shocking family secret, band together to harness their powers, and face the evil Lord Mediarn with an end that will leave you wanting more. Fantastic read. I will be getting my grandson to read this. I could not put this book down til the end. I can't wait for the next book.